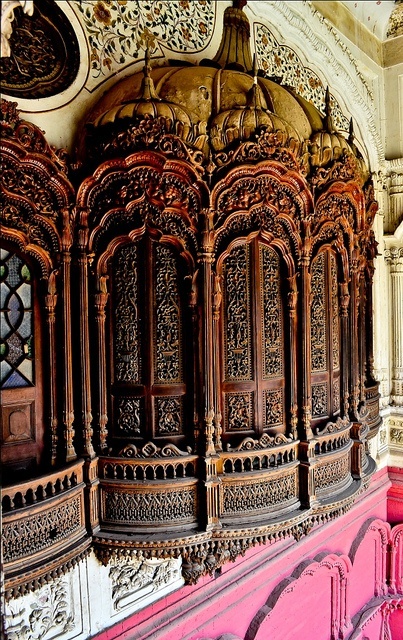 Omar Hayat Mahal Library is a 19th century wooden architectural wonder of Chiniot, Pakistan. The palace's building is perhaps the last of Mughal’s architectural style, or a Mughal Revival building ("revival" buildings are interpretations of an old architectural style by people of a later era). Unique carving cuts on the doors, windows and jhirokas reflect a colour of their own. The roofs, balconies, stairways, terrace and the stucco designs make a perfect interior. The facade of the building is decorated with a fine inlay of bricks, the dazzling shine of marble and picturesque shades help it rank among the great palaces of Mughal era landlords.